'Feel Fab Feb’ is a whole month of mental and physical wellbeing activities for all Edinburgh Napier students and staff, brought to you by ENSA. We have created an amazing programme of events, jam packed with relaxation, mindfulness, training and physical activities to wash away those February blues! With events being held across all three campuses, there is something for everyone; whether you’re interested in gym activities at Sighthill, enhancing your knowledge through CBT training at Craiglockhart, or just want to relax with ‘Therapets’ and yoga at Merchiston, Feel Fab Feb will cater for all your wellbeing needs! Remember, all of the events taking place in Feel Fab Feb are completely free for Edinburgh Napier students and staff. Some events require registration to reserve your place - details on these will follow shortly. Throughout February, we will be raising money for SAMH, with donation buckets at all our events! Any donations are very much appreciated and will go a long way to helping to support those experiencing mental health issues. We want you all to feel fab in February, so come along and try something new today! Check out the daily breakdown of events here. 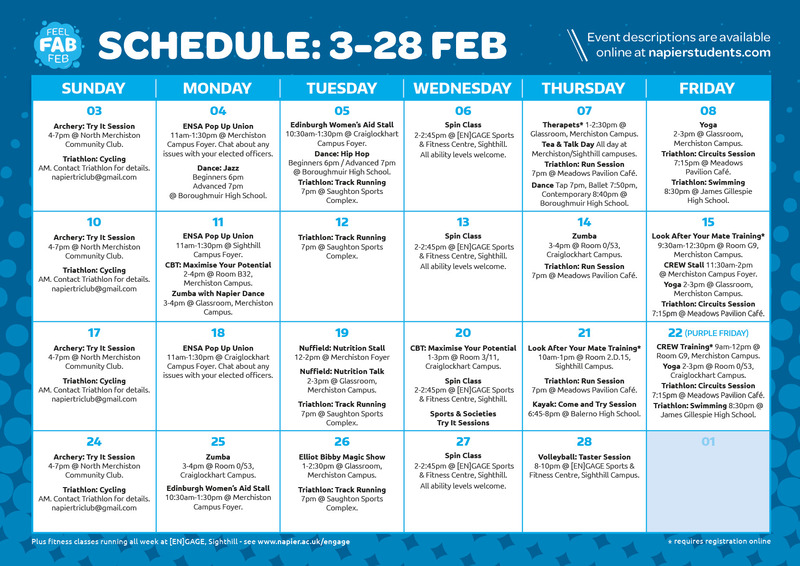 Download the Feel Fab Feb timetable as a PDF.